When his lover is murdered by her cruel husband, an 18th Century Venetian nobleman is placed by his magician friend into suspended animation. Awaking 200 years later, he finds the experiment has unexpected consequences. One of the stranger films to emerge from Britain in the 1920s, Man Without Desire was the feature film debut of Adrian Brunel , better known today for a series of short burlesques, including Crossing the Great Sagrada (1925), and as a founder of the Film Society with Ivor Montagu and others. Asked to direct a period drama set in Venice, Brunel , conscious that period could be a box-office turn-off, offered a compromise, with the early 18th Century Venetian story framed by events 200 years later. Despite a tight budget of £5,000, there were sufficient funds for location filming in Venice. Studio and post-production work took place in Germany, and the film shows the influence of the emerging German expressionist films, notably The Cabinet of Dr Caligari (Der Cabinet Des Dr Caligari, d. Robert Weine, 1919), whose somnambulist emissary, Cesare, is echoed in The Man Without Desire by the magician-scientist's Indian manservant, and Nosferatu (d. F.W. Murnau, 1922). It's worth noting that Brunel 's German visit came some two years before the first visit by the young Alfred Hitchcock . As the title - which surprisingly made it past the censor - suggests, Man Without Desire concerns loss of sexual desire and, implicitly, impotence. 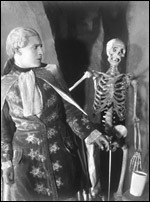 At its centre is Ivor Novello (on his way up but not yet the stage and screen idol he was to become) as tragic lover Vittorio, who, in despair at the death of his love Leonora, volunteers to be put into suspended animation, awaking after two centuries and immediately finding himself attracted to Leonora's descendant - and virtual double - Genevra. But Vittorio's slumber has robbed him of his passion, and their marriage is unfulfilled. Novello 's other-worldly beauty and sexual ambiguity - a homosexual when such things weren't spoken of - is perfectly suited to Vittorio's aloofness, just as it was to his more celebrated role as Hitchcock 's The Lodger three years later. Man Without Desire was the first of three films with Brunel , including Noël Coward 's The Vortex (1927).